Zonal mean zonal wind at 60N and 60-90N mean temperature anomalies for the 120 days surrounding the 2004 Jan 5 sudden stratospheric warming. 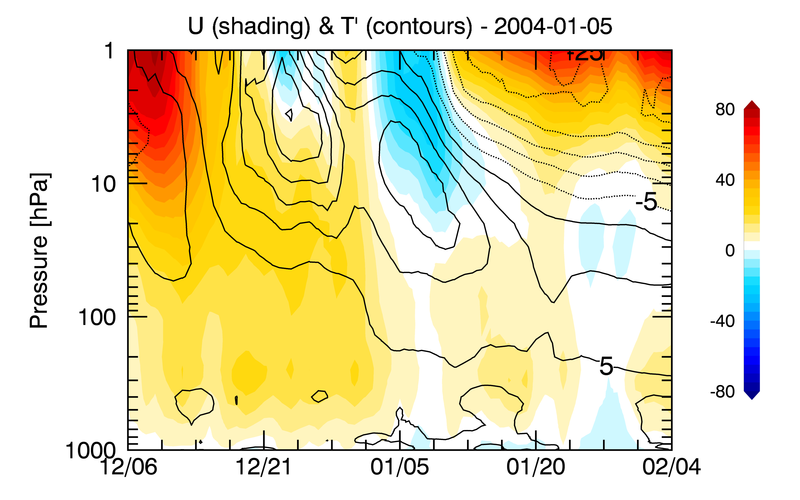 The descent of easterlies (blue shading) and warming (solid contours) shows the typical structure for SSWs. Average surface temperature anomalies for the 60 days following the 2004 Jan 5 warming event. Sudden stratospheric warmings (SSWs) are large and rapid temperature increases in the polar stratosphere associated with a complete reversal of the climatological westerly winds in wintertime. 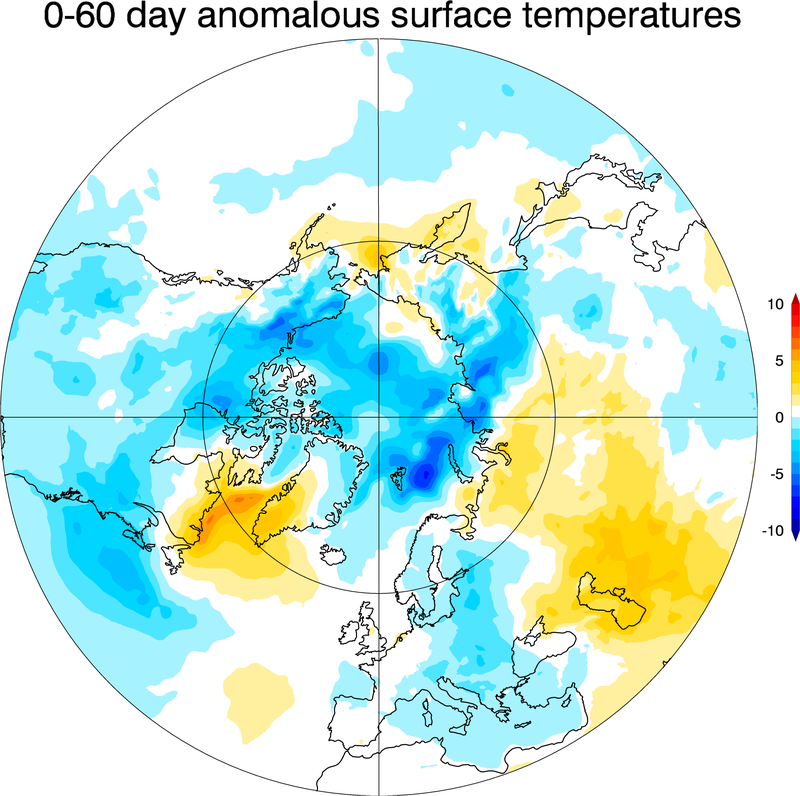 These events can have substantial impacts on wintertime surface climate, such as extreme cold air outbreaks over North America and Eurasia, or warming over Greenland. This compendium of historical SSWs documents the stratospheric, tropospheric, and surface climate impacts of these events, both individually and composited, using a variety of time series, maps, and animations of daily data. Here, we examine only major mid-winter warmings, as defined by a zonal wind reversal between November-March of the 10 hPa and 60N zonal winds from westerly to easterly (Charlton and Polvani 2007). Additional events, such as minor and final warmings, may eventually be included. Analyses are available from 6 different reanalyses: MERRA2 (1980-2014), JRA-55 (1958-2014), ERA-interim (1979-2014), ERA-40 (1958-2002), NOAA20CR (1958-2011), and NCEP-NCAR I (1958-2014). Anomaly fields are calculated from smoothed daily climatologies based on the full record of each reanalysis. Data is provided 60 days prior to and after each event. The Sudden Stratospheric Warming Compendium (SSWC) database provides a simple way to plot and download information on historical SSW events; to consider the development, evolution, and impacts of both individual SSWs and their composite; and to provide a basis for model evaluation and improvement. These SSWC data are made freely available to the public and the scientific community, and are the product of extensive research and effort to maintain and improve their accuracy and quality. However, the availability of these data does not constitute publication, and NOAA Chemical Sciences Division (CSD) and their collaborating partners require citable outputs from their research to ensure its continued support. We therefore expect all users of this data to ensure that the responsible scientists receive fair credit for their work, and are offered the opportunity to contribute to the research uses of the data as they deem appropriate. These data are freely available for exploratory analysis. At such time as a journal publication or conference presentation is planned using these data, the Compendium collaborators (Amy Butler and Jeremiah Sjoberg) should be informed of the nature and aims of the research project and the intended use of the data. Contacting the Compendium collaborators will ensure they have adequate foreknowledge of the proposed research and thus the opportunity to contribute as appropriate to the use of SSWC data in the proposed research project. If the Compendium collaborator makes a significant intellectual contribution to the research, co−authorship would normally be expected. This should be discussed at an early stage in the work. Manuscripts using the data with NOAA co−authors should be sent to the coauthors for review well before (e.g. 4 weeks) they are submitted for publication, to ensure that the quality and limitations of the data are accurately represented and the coauthors have adequate time to provide input. Cite this data set when used as a source: Butler, A. H., J. P. Sjoberg, D. J. Seidel, and Karen H. Rosenlof, A sudden stratospheric warming compendium, Earth Syst. Sci. Data, doi:10.5194/essd-9-63-2017, 2017. Cite the original data creators for each reanalysis used from the SSWC. See the Input data description section of the User's Guide for the appropriate citations. Please check this box to signify acknowledgement of our data policy and access this data set. Four plot types are available. Select a value from each menu following a chosen plot type to browse that data.